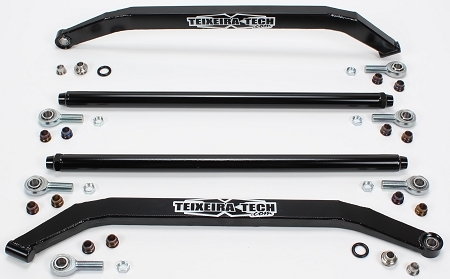 Our Teixeira Tech Polaris RZR Turbo XGC (X-treme Ground Clearance) Radius Rod Kit has been engineered to have the best strength to weight ratio possible while still maintaining our industry leading ground clearance. By using large 4130 chromoly tubing for the upper radius rods and 4130 chromoly sheet with an additional center strengthening rib on our lower radius rods, we were able to maintain the same weight as the stock radius rods but have a much more durable and reliable kit. To keep our mounting points as durable as the rest of our radius rod, we use FK bearings at all the mounting points with 17-4 stainless steel high misalignment reducers. We take our 17-4 stainless reducers another step further than the competition and have them heat treated. Semi-Gloss Black is our standard stocked color. Please allow 5-7 working business days for other colors. 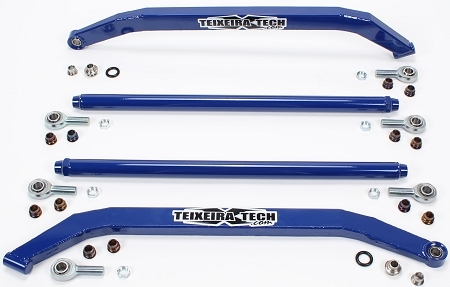 May not be compatible with some bumpers that mount to frame between upper and lower radius rods without bumper modification.